<\/strong>High source of protein and iron. Best vegetable source of vitamin B12. Helps to support blood, bone and cardiovascular health. Promotes healthy skin, immune system and good eye health and vision. Good brain fuel - excellent for memory and nerve function. Traps cholesterol and helps remove it from the body. Provides the nutritional equivalent of 7 servings of fruit and vegetables. High source of protein and iron. Soya Lecithin, Rice Kernel Membrane Powder, Kamut, Wheat Grass Juice, High Apple Fibre, Barley Grass Juice, Hawaiian Spirulina, Broken Cell Wall Chinese Chlorella, Jerusalem Artichoke Powder, Wheat Sprouts, Icelandic Kelp, Nova Scotia Dulse, Apple Pectin, Royal Jelly, Co Enzyme (CO-Q-10), SOD W/Catalase, Lactobacillus Acidophilus (Lactose Free) and Bifidus Bacterium (Lactose Free). Lactose free, gluten free*, dairy free. Suitable for vegetarians. * The grasses are harvested young and at their peak of nutrition, prior to jointing and before any gluten is formed in the plant. Gluten is found only in the seed kernel not the actual grass. Consume a minimum of one serving each day. For optimum results take three servings per day. Additional servings are recommended when the diet is lacking in green vegetables or where long term chronic nutritional needs persist. 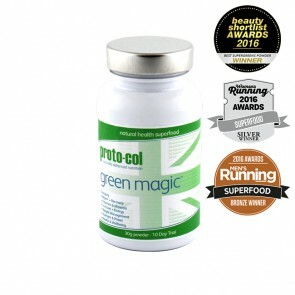 Mix proto-col Green Magic powder into your favourite juice, still mineral water or blend it into a smoothie or shake. The drink will go green but that’s just the goodness. There is hardly any taste and if you mix it with juice or blend it into a smoothie you won’t taste it at all.